Context: Listened to this off librivox as I commuted between Saudi and Bahrain. A very, very long time ago, when he was just a wee lad, Arukiyomi attempted to read this and didn’t get too far. This time, I listened to this via librivox.org and can easily say that Mil Nicholson does one of the best narrations there that I’ve heard in many years of enduring librivox recordings. 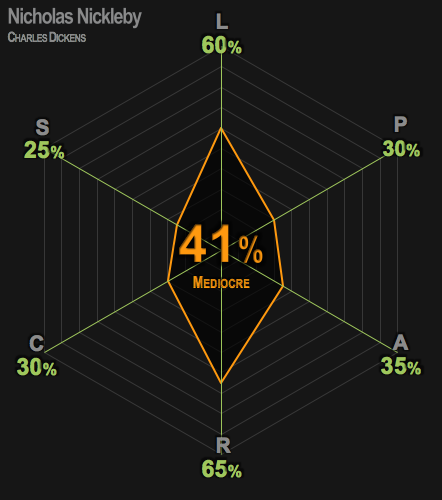 Now that I have finished it, I can easily forgive myself for bailing halfway through. This is not Dickens’ best and the story and characters aren’t sustained in any memorable way as the novel gets into its latter half. For a start, the novel isn’t about the life and adventures of Nicholas Nickelby and not least because it ends when, presumably, Nicholas has many decades yet to live. 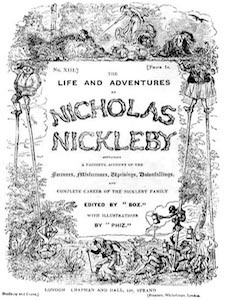 Dickens starts out well enough with Nicholas featuring prominently as the novel opens with him accepting a job at the, now infamous, Dotheboys Hall boarding school as a result of having to support his family his father’s death. The scenes at Dotheboys are very memorable which is a shame for the rest of the novel because, once he leaves in dramatic style, the rest of the novel pales into a series of limp events and characters that lack the development of Dickens’ later and more famous novels. Dickens doesn’t help matters by tying every loose end up nicely as the novel concludes, and there are also some long drawn out death scenes which are overly melodramatic. If you’re ploughing through the 1001 list or you feel like you should be reading all of Dickens’ works then this is worth a read. Otherwise, I’d give it a miss and head straight for novels built upon this like A Christmas Carol or his outstanding bildungsroman, David Copperfield. There once lived in a sequestered part of the county of Devonshire, one Mr. Godfrey Nickleby, a worthy gentleman, who taking it into his head rather late in life that he must get married, and not being young enough or rich enough to aspire to the hand of a lady of fortune, had wedded an old flame out of mere attachment, who in her turn had taken him for the same reason: thus two people who cannot afford to play cards for money, sometimes sit down to a quiet game for love. Through all the spring and summer-time, garlands of fresh flowers wreathed by infant hands rested upon the stone, and when the children came to change them lest they should wither and be pleasant to him no longer, their eyes filled with tears, and they spoke low and softly of their poor dead cousin.